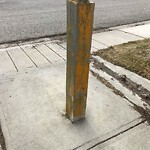 Bollard requires painting to be better seen by cyclists and skateboarders. 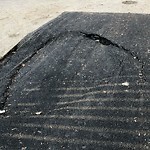 A recent water line repair is caving in and will need to be paved again. 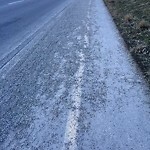 Bike path along premier from 8th street to 10th Street is covered in gravel, given it's a hill it makes it difficult to navigate on a bike. Bike and pedestrian counter hasn't been working for a while. 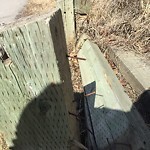 Many posts have nails protruding as seen in the photo. 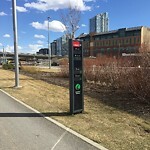 This is along the Bow River pathway about 100 yards north of the 130th Ave entrance. 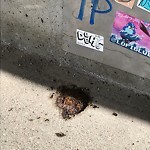 Feces (human?) on path. 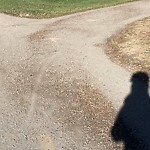 At south side entrance to memorial drive crossover. 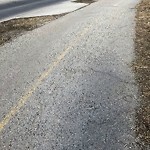 Pathway between meadowview rd SW and the alley leading to 58ave hasn't been sweep and is covered in excessive amounts of gravel which is dangerous for bikes.